Recently I have been working on a crazy busy project at work as well as preparing for the CCIE SP lab (did not pass). Well now that is all behind me so I figured I would take some personal time and play with some technology that I have read about, talked about, and even sat through presentations at Cisco Live (aka Networkers) in the past. What is this technology that has me so interested you might ask. Well, its LISP – Locator Identifier Separation Protocol (ietf draft can be found here – http://tools.ietf.org/pdf/draft-ietf-lisp-11.pdf). The next question you may have is why does this interest me? To be honest, I have no idea – just thought it was a nifty idea. So, what is LISP? The easiest way to explain it is to give you a common analogy that we all understand, DNS. When a user wants to access a website – in this case – blog.fryguy.net, they send a DNS query to the configured DNS server. The DNS servers then resolves that DNS name to an IP address – 76.74.254.123 – and sends that back to the client. The client web application then makes a connection to the web server and retrieves the website. Well, in LISP a very similar thing happens. 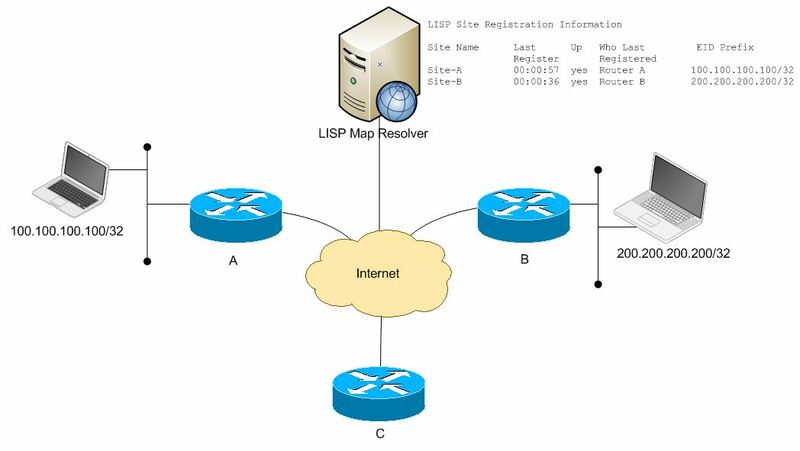 If a router needs to send a packet to 76.74.254.123, and that route is not in the local routing table – it sends a query to the LISP Map Resolver. The LISP Map Resolver then looks at its database and tells the router that the network can be reached via 4.71.170.2. The router then sends a LISP encapsulated packet to 4.71.170.2 to be then forwarded onto its ultimate destination. That is a very simple explanation on how it works, and one that I hope most networking folks should be able to understand. Now lets take it a step further – and think about moving a device around, yet keeping the same IP address (think vmotion). If you are registering a device location with a server, you can then move that device around and the mapping server will be able to redirect you to the correct site. There are other things that LISP can do, but I will save the IPv6 one for a future post. 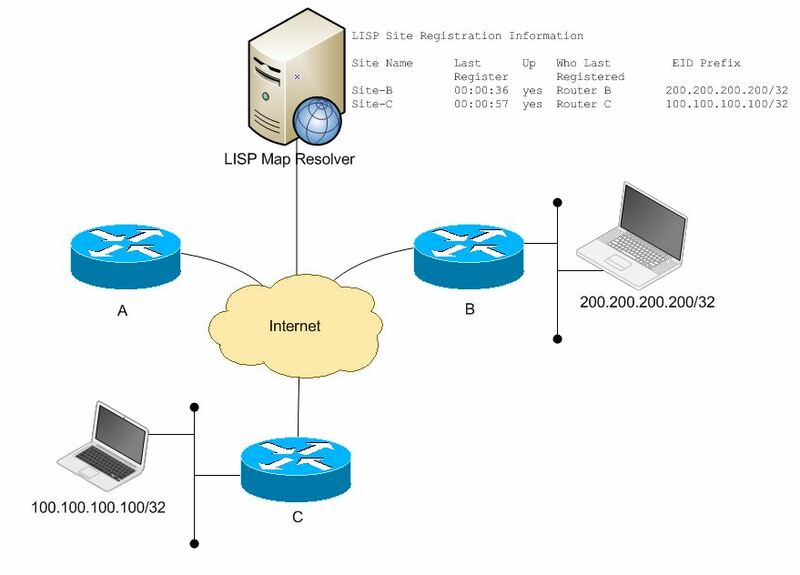 We have host 100.100.100.100/32, called an EID – Endpoint Identifier – that is sitting behind Router A. Router A will register that network, or host in this case, with the LISP Map Server. It will say to get to the EID prefix of 100.100.100.100/32, send the packet to Router A. We also have another EID at 200.200.200.200/32 that is sitting behind Router B. Router B will also register with the LISP Map Server that host 200.200.200.200/32 is reachable via Router B. So if 200.200.200.200/32 wants to talk to 100.100.100.100/32, it will send the packet to Router B – Router B will then ask the LISP Mapping Server how to get to 100.100.100.100/32. The LISP Map server will respond – to get to 100.100.100.100/32, send the packet to Router A. Router B would then in turn send the packet to Router A, who will then process the packet and forward it onto 100.100.100.100/32. Now what happens if we move 100.100.100.100/32 to Site C? In a normal network, we would have to change the IP address of the host to a network that is reachable via Router C. You typically cannot advertise the same network from two sites and expect things to work correctly. But with LISP, you can move the host around and not change the IP address. Why? Well, the Mapping server is what tells the routers who want to talk to 100.100.100.100/32 how to get to the host. So lets move 100.100.100.100/32 to a location in Site-C behind Router C. Router C would then register with the LISP Map server that 100.100.100.100/32 is now reachable via Router C. The next time that 200.200.200.200/32 goes to talk to 100.100.100.100/32, Router B will query the LISP Map Server who will then tell it, to get to 100.100.100.100/32, send the packet to Router C for processing. Another use case could be with a multi-homed site, like the picture below. Typically with BGP you can only “recommend” an ingress point into your network, you have no way of guaranteeing the traffic will only flow into Router B from your upstream ISP. Sure, you can prepend AS numbers; tweak the mutli-exit discriminator (MED), etc – but it is only a suggestion to your upstream ISP. So what can LISP do for us here? Easy, you can set a priority to the mapping on the LISP server. 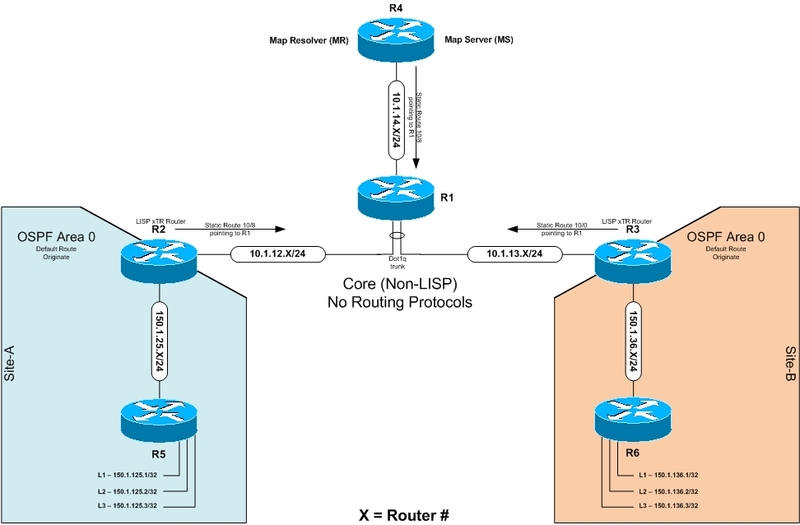 You can say that Router A has a higher priority for ingress traffic then Router B. The LISP server will then return the path with the lowest Priority listed is the preferred route. This will help to make sure that the traffic is flowing inbound the way that you want it to. The Ingress Tunnel Router (ITR) is a router that is deployed as a LISP edge device. It receives packets from the internal hosts and encapsulates packets to remote LISP sites, or if necessary, forwards packets natively to non-LISP sites. The Egress Tunnel Router (ETR) is a router that is also deployed as a LISP edge device. It receives packets from external hosts and decapsulates the LISP packets and delivers them to internal hosts (EID)s. Typically the ITR and ETR are the same devices, so you will commonly see xTR listed for these devices. An Endpoint Identifier is a host or network behind the xTR device. The Routing Locator (RLOC) is the outside IP address of the ETR. When the EID is registered with the mapping server, this is the address that is provided for reach-ability to the EID. The Map Server (MS) is a critical component that learns EID-to-RLOC mappings, analogous to registering you FQDN and IP to a DNS server, from the ETR. The Map Resolver (MR) is the server that handles the queries from the ETR for RLOC to EID mappings. This, again, is analogous to DNS lookup for name to IP address mappings. The last item I have in that list is DFZ . The Default Free Zone (DFZ) is a network with no default-route in it, basically you can think of this as the Internet – there is no default route there, the only routes that are reachable are advertised. There are other components as well, but these are the ones that are typically mentioned. If you can understand what these do, if we add a P for Proxy in front of some of the acronyms (PETR or PITR), you can probably figure out what it is doing and what it means. When it comes to the LISP – Alternate Logical Topology (LISP-ALT), this is the mapping mechanism that Cisco is supporting. It is a hybrid push/pull architecture that aggregates EID prefixes that are “pushed”, and may push that information to other ITR routers. EID-to-RLOC mappings are “pulled” by the ITR when an explicit request is made or triggered. Basically it seems to be a way to keep the cache on the xTRs up to date with changes. At least that is what I gather from the information. Routers R1, R2, R3, and R4 are all Cisco 3845 ISR routers; R2, R3 and R5 running 15.1(1)XB3 IP BaseK9 code while R1 is running 12.4x code. The reason R1 is not running 15.x code is insufficient memory and also 12.4 code does not have LISP support, so we can be sure that LISP is transparent to non-LISP devices. R5 is a 2621XM and R6 is a 3825 router running 12.xIOS code. The IOS code on these does not matter, for all intense purposes they can be computers, iDevices, etc as they are the EIDs in this network. For R1 I had limited Ethernet ports, so in order to save cabling, I trunked the VLANs for R2 and R3 onto the G0/0 interface. So lets start the fun stuff, the configuration! We will start with R1 as it is the core of the network in the diagram. Nothing fancy going on here, just basic router interface config. No routing protocols, no default routes, just interfaces with IP addresses. From there we will continue onto R5 and R6 as these are just EID devices – they have no LISP configurations on them, just simple routers. Now with R5 we have a few loopback interafces configured as well. These loopback interfaces as the EID devices for this lab so that we can demonstrate connectivity. We have configured a dynamic routing protocol, OSPF, so that this router can learn a default route from R2. Since R2 is not configured yet, we are not learning the default route from R2. Now with R6, like R5, we have a few loopback interafces configured as well. These loopback interfaces as the EID devices for this lab so that we can demonstrate connectivity. We have configured a dynamic routing protocol, OSPF, so that this router can learn a default route from R3. Since R3 is not configured yet, we are not learning the default route from R3. So that covers all the non-LISP routers in the diagram, now lets move onto R4, the LISP Mapping server in this topology and I will discuss the configuration in-line with the config. We will add a route to 10.0.0.0/8 network so R4 knows how to talk to R2 and R3. We are only doing this because we are not running BGP in our core and we need to tell R4 how to talk to the other routers in its network. Now we can configure a VRF for the LISP routes. If you are wondering why the command is vrf definition, that is because 15.x the command changed from ip vrf. Since we are also only dealing with IPv4 (for now), we need to define the ipv4 address family. Now we will define our first LISP site, Site-A. We will configure our authentication key as well as what EID prefixes are associated with that location. Here we are configuring some mappings for Site-A as 150.1.25.0/24 and 150.1.125.0/24. Now we can enable the ALT service on this router, we just need to tell it what VRF this data will reside in – hence the reason we created the LISP VRF before. Now that we have everything configured on R4, we can look at the lisp site summary and check the site configuration. As you can see, we have 4 EID prefixes configured, but none registered. There are none registered because R2 and R3 have not been setup yet. But once they are, R4 will accept the registrations and the numbers will change accordingly. Also notice that the only address family currently listed is IPv4- we have not done any configuration for IPv6 yet under the VRF. We can start by configuring the ITR and ETR interfaces on the router. G0/0 is the ETR and G0/1 is the ITR interface. Now we can configure a routing protocol (OSPF here) for the ITR side of the network. This will allow R2 to send R5 a default route via the default-information originate always command. This is necessary because R5, the EID, does not know about LISP. We will now add a static route for the 10/8 network. This is being added so the router knows how to route to other 10/8 networks. Notice this is not a default route. Now we can configure our LISP database mappings, assign the priority for ingress traffic, as well as any weights for load balancing we would like. Now we can configure the egress map-server so we know who to register with, again R4 at 10.1.14.4 and the appropriate password. We will configure this just like R2, just change the networks where necessary. As we can see, they both have only the locally connected routes (C) as well as a default route from R2 and R3 prospectively. The default route is only being propagated as these are EID devices, so they are not aware of anything outside their routing domain. 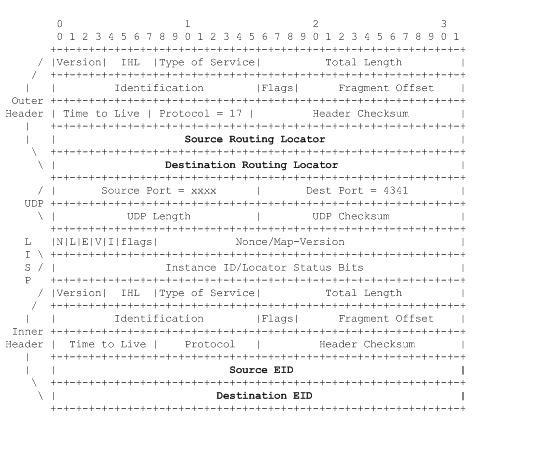 So we see we do not have a default route (default-free zone – DFZ), we have learned the EID routes from R5, we have a static for the 10/8 network that we configured, and we know about the connected routes. That is all that we have. There are no routes for R6 on this router. Again, do not have a default route (default-free zone – DFZ), we have learned the EID routes from R6, we have a static for the 10/8 network that we configured, and we know about the connected routes. That is all that we have. There are no routes for R5 on this router. …and scrolled on the R2 console we see a whole bunch of the messages that are displayed below. I have commented on about the interesting lines and put in appropriate explanations. So here we get a request to connect to 150.1.136.1/32. *Apr 7 03:29:33.571: LISP: Remote EID prefix 150.1.136.1/32, Change state to incomplete (method: data-signal, state: unknown, rlocs: 0). …so we schedule and send a map request. *Apr 7 03:29:33.571: LISP: Remote EID prefix 150.1.136.1/32, Scheduling map requests (incomplete) (method: data-signal, state: incomplete, rlocs: 0). *Apr 7 03:29:33.607: LISP: Remote EID prefix 150.1.136.1/32, Send map request (1) (method: data-signal, state: incomplete, rlocs: 0). *Apr 7 03:29:33.607: LISP: AF IPv4, Sending map-request from 150.1.25.2 to 150.1.136.1 for EID 150.1.136.1/32, ITR-RLOCs 1, nonce 0xFE068986-0xFE4F94B7 (encap src 10.1.12.2, dst 10.1.14.4). *Apr 7 03:29:33.607: LISP: Map Request prefix 150.1.136.1/32 remote EID prefix, Received reply with rtt 0ms. *Apr 7 03:29:33.607: LISP: Remote EID prefix 150.1.136.0/24, Change state to complete (method: map-reply, state: unknown, rlocs: 0). *Apr 7 03:29:33.607: LISP: Remote EID prefix 150.1.136.0/24, Starting idle timer (method: map-reply, state: complete, rlocs: 0). *Apr 7 03:29:33.607: LISP: Remote EID prefix 150.1.136.1/32, Change state to deleted (method: data-signal, state: incomplete, rlocs: 0). *Apr 7 03:29:33.607: LISP: Remote EID prefix 150.1.136.0/24, Recalculated RLOC status bits from 0x0 to 0x1 (method: map-reply, state: complete, rlocs: 1). *Apr 7 03:29:33.607: LISP: Remote EID prefix 150.1.136.0/24 locator 10.1.13.3 priority 1 weight 100, Added locator (method: map-reply, state: complete, rlocs: 1). As you can see, all that took place in less then a second! That is a basic overview of LISP and how it works. I will admit that I did not talk about LISP encapsulation within the communication between the RLOCs and such, but below is a diagram (from the IETF Draft) of the header packet for the communication. Since we do need some tunnel headers, and they are prepended to the original packet, so one may need to be cautious of MTU issues. If you want the details on that, I suggest you read the IETF document as it has all the information contained within it. Configuration Files for the routers are below, I have tweaked some configs in this blog (Interface descriptions) that are not referenced in the config files below. Besides that, these are the configs that are on these routers as I write this blog. I suggest your right-click and do Save As as they are all text files.